The floodgates have opened and spring has arrived! We've had a wild ride this winter and the beginning of spring has proven no different. So far, in the month of March, we've had ground blizzards (leaving two foot snow drifts), sunny, 60 degree days, melting the snow so quickly that we can hear the sound of the snow turning into torrential rivulets of water, and pounding rains that work to erode the very ground beneath our feet. In anticipation of what we knew would be an exceptionally wet spring, the children and I dug a creek in the front garden. Really! The area in front of our "shouse" gets wet every spring. The ground absorbs water for a while then becomes saturated and runs straight in our front door. It is crazy making! Over the years we have put pallets on the ground to keep us out of the puddle, dug trenches to redirect the water and poured gravel into the mud at front of the door. This year, we decided to take action! The first thing we did was dug up the area in front of the door, making sure that everything sloped toward the garden. After we sloped the area by the front door, we began digging, winding our way through our little side garden and ending at the edge of the shouse, to drain into a ditch that channels water into the back field. After we dug the "creek", we set about filling it, first with smaller pebbles and then with river rock. We chose a pretty, light colored river rock so that it would be a nice feature in the garden even when it wasn't being useful channeling water from our front door. The brook is taking form! Already our wandering brook has proven useful. As the rains have fallen, our doorstep has stayed dry. Instead of mud and mess, we've had a bubbling brook gurgling the siren song of spring. Although the "shouse" has been spared the sometimes devastating effects of springs, our driveway has not. For the first time in almost 20 years, our driveway has collapsed, leaving it almost impassible. Sir Knight calls our driveway a "4-wheel drive confidence course" and everybody who attempts to maneuver it takes their life in their hands! Even walking down the driveway can be dangerous with the ground giving way under each foot fall. It is very similar to traversing a bog, almost like walking across a water bed! Our driveway isn't the only roadway that has been compromised! The major (only) highway into a nearby mountain town has been closed for an indefinite amount of time. The roadway has literally crumbled beneath the asphalt, leaving gaping holes 3/4 of a mile long (and growing daily). What used to be a 20 minute commute from the small community has now become an hour and 45 minute trek through mountain passes, many of which are still flooding! Ah, the joys of spring! Soon the summer winds will blow, drying out our driveway and turning our boggy lane into solid ground. As the mucky ground turns to dirt, we will rock the driveway, filling in the low spots with base rock and layering gravel over the rest. 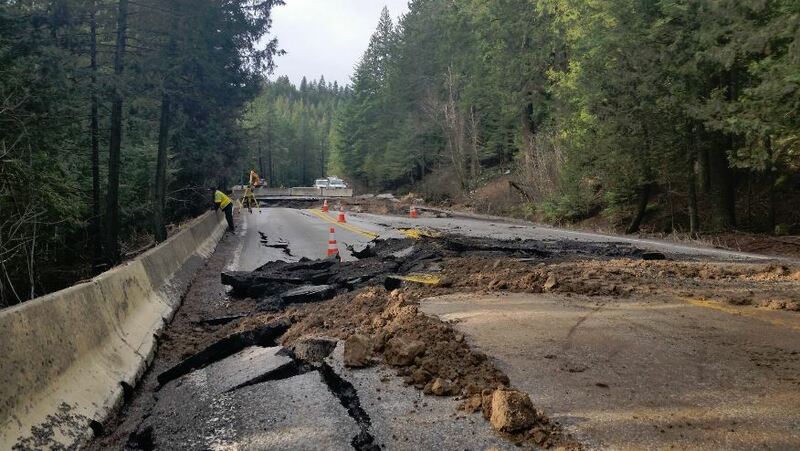 We will fix the damage done throughout the winter and spring and prepare for the elements of yet another year - hopefully a year without collapsing roads and rushing creeks. I was born and raised on a farm in Illinois. One spring the gravel road, the main way to the nearest town in either direction, turned into a sponge. It got so bad that we and the neighbors parked our car on the nearest paved road and took tractors from there to home. This went on for abut 1 month. 2 years later I moved to town with my grandmother so I could get to school as the roads were again impassable. That road is now paved so the worst you would have today is water running across the road during a heavy rain. Ah the good old day's. It is amazing how just 2 natural laws of water affect mankind. Water runs downhill. And it expands upon freezing. Ahh, the joys of living in the back country, I wouldn't change a thing! Is the ground there in the panhandle gumbo? It is here in central SD. Very fun in the early spring when the ground is saturated. I remember making a unilateral decision one spring as a teen to dig some "redirection trenches" in my Dad's back yard. We had had quite a bit of excavation done to build an addition (including a deck that was well below grade on the north side) to his trailer the previous summer, not thinking about the sheer amount of water that came off the hill in spring. Come March, the deck flooded, the retaining wall turned into a fountain, my clothesline stood in a small lake of mud, and water was threatening to come in under the back door. Lacking any understanding whatever of civil engineering, I didn't do nearly so good a job as you and your family have done... but I did learn a lot (and pay much more attention to my courses in the physical sciences after that). You are teaching your children well. They are getting a better education in the practical and useful things of life than they could ever get in any "sit-down school," public or private. I commend you most highly. Eventually, my Dad saved up money to have French drains constructed out of partially perforated PVC pipe and gravel (at that point in our lives, the mines were working sixty-five hours a week 50 weeks a year, and time was at a higher premium than money, but we could easily have done the work ourselves even with our limited skills). Funny you should phrase it that way. I've always had a shortage of both time and money or just barely enough time and money but never a surplus of either. We live just east of you guys and seem to have had similar winter weather this year. We have experienced the same water issues, too. Our driveway and small road have almost completely washed out due to runoff. If I remember waaaayyy back to December, we had weeks of really cold temperatures (below zero temps) before the snow fall. So I'm thinking that the ground under all that runoff is still frozen. Every year the melt off is different. Ahh~ life in the country!